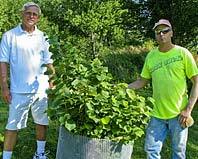 From across the country Foundation members write to share news about the progress of the hazelnuts they are growing in their yards, acreages and farms. The 1929 visionary J. Russell Smith would be pleased with what we are hearing. His dream of lush green hillsides and stream banks protected by highly productive woody crops is becoming a reality in the form of farmland and backyard hazel orchards being planted by tens of thousands of members just like you. Share your experiences with other Charter Patrons in the Hazelnut Project. Remember to send us photos year-round showing how you’re growing and enjoying healthy Arbor Day Farm hazelnuts. This fall I harvested my first crop of hazelnuts. A new evening dynamic has evolved after dinner as my wife and I sit with the vise grips and a couple of baskets, cracking hazels and separating the shells from the nutmeat. We have spent more time being together than at any time since our courtship over 30 years ago. My wife thanks you. I thank you, too. Together we look forward to finding better ways to crack all these nuts. This is one of the few ways that a person can actually grow protein in his or her garden. Sure, one can grow plenty of vegetables… fruit and produce but not actual protein. That’s why I’m so excited about this project.